The American-French Genealogical Society during its 25th anniversary introduced the AFGS French-Canadian Hall of Fame. The hall of fame will recognize individuals of French-Canadian ancestry who have made significant contributions to their community, or who have achieved success in their life?s endeavors. Four individuals were inducted in the Class of 2003. Marie Louise Bonier, who researched the early French-Canadian settlers in Woonsocket. Her book, Debuts de la colonie Franco-Americaine de Woonsocket, Rhode Island, was published in 1920. The English translation was released in 1997. Alphonse Desjardins, who in 1900, created the first credit union in North America, the Caisse populaire, which provided French Canadians in Quebec with loans at fair interest rates. His system was later brought to United States, with the first credit union being formed in Manchester, New Hampshire. René Jetté, historian, genealogist, and demographer, has written more than 20 repertoires on French-Canadians, including the popular Dictionnaire généalogique des familles du Quebec des origins a 1730. Ben Mondor, Chairman and owner of the Pawtucket Red Sox, is a former Woonsocket mill owner who successfully renovated and operated textile mills in the area for many years. Mr. Mondor purchased the bankrupt baseball team in 1977 and has made it one of the most successful operations in professional baseball. He created the Pawtucket Red Sox Charitable Foundation to assist numerous charitable organizations around New England. The daughter of Augustin Bonier dit Plante and Adeline Normandin, Marie Louise Bonier was born in 1867 in what was then the Waterford section of Smithfield, R.I. Her maternal grandparents were Joseph Normandin and Ursule Beauregard who had come to the area in 1844. In 1871 Waterford was incorporated into the newly formed Town of Woonsocket. In 1914 Ms. Bonnier embarked on a project that she saw as a "felt need". It would become the crowning accomplishment of her life. She had begun a research project on the first families from French-Canada to settle in Woonsocket. Finally published in 1920, when it sold for $1.00, her work was entitled "Debuts de la colonie franco-americaine de Woonsocket, R.I.". Her research identified 117 families who had immigrated to Woonsocket between 1814 and 1861. She devoted six years to checking marriage and death records and learned that most of the families came from the villages of the Richelieu and Yamaska River valleys, with 23 families from St.Ours. The Institut Francais of Assumption College, Worcester, published an English edition of the Ms. Bonier?s book, in revised form, in 1997 with editing and translations by Dr. Claire Quintal. Marie Louise Bonier, on her passing in 1927, was eulogized as " ?historian, foundress of a women's club and a civic leader". The reference to a club is the Cercle Marie-Louise, which Ms. Bonier began as a women's social and civic-service organization. For her important genealogical research of the early French-Canadian settlers in Woonsocket, the American French Genealogical Society is honored to include Marie Louise Bonnier as a member of the AFGS French-Canadian Hall of Fame, Class of 2003. 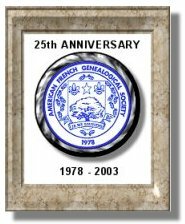 The American-French Genealogical Society, founded in 1978, is a non-profit organization devoted to assisting people of French-Canadian ancestry in the research of their family history.